Just where has June gone? Of course it is raining; it is Wimbledon. But unlike other years, we have arrived at the beginning of July and we have had no summer at all yet, with hardly any days to wear summer clothes. It is infinitely depressing to see the vegetables on a go-slow and the longed for Arran Pilot new potatoes succumbing to early blight, the courgettes refusing to budge, broad beans about a centimetre long and the slugs having a field day. It is just as bad on the farm. I have a very irritable husband, not surprisingly really; this must be the first time in 40 years of farming that we have actually made our silage in three days of incessant rain! Poor cows in the winter, their daily diet won’t be tasting too good but it is all they will have. There is no choice this year. But I feel most sad about the complete lack of apples and pears. I suppose this is inevitable as my husband gave me a wonderful apple press two Christmasses ago but we did have the luxury of a bumper crop last year. All the grandchildren turned their hand to applepressing which they loved and their reward for the very hard work of turning the stiff handle was to go home with old plastic milk bottles full of delicious fresh apple juice. It was a full-on battle with armies of wasps and the Waspeze was an essential back up! 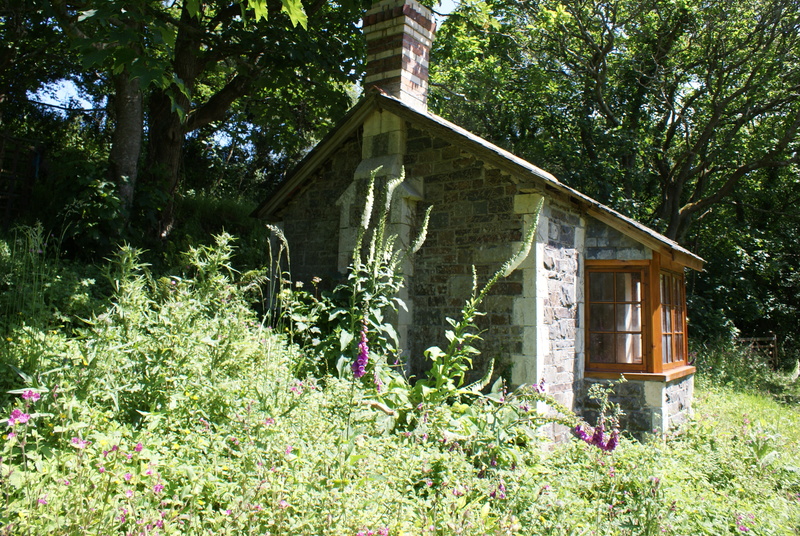 So now we wonder what the children (and the wasps) will do this autumn…. June started so happily with the Jubilee weekend and all the wonderful celebrations. Hartland really did the bunting in great style and the village looked very jolly. The flags are still flying despite horrendous gales since, and the village is looking very welcoming to all the summer visitors who come to this corner of England. We have had some amazing visitors this summer, who even on the worst of days, have brought smiles and good humour to the house and written lovely comments in our book. Thank you to everyone who has made the effort to come this far and I am so sorry if we have not always been there to meet you. 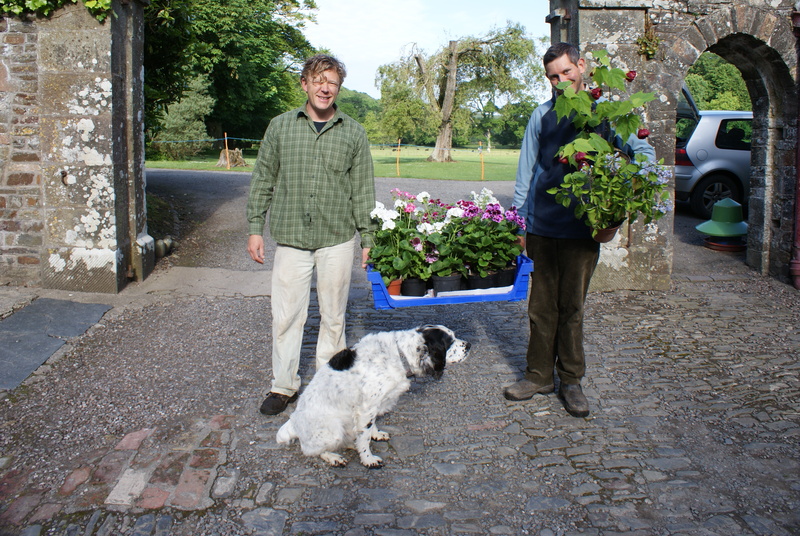 Nigel and Sam in the garden have done everything possible to keep the gardens looking good; their job is the best in good weather but goodness it is hard work when the elements are against them. 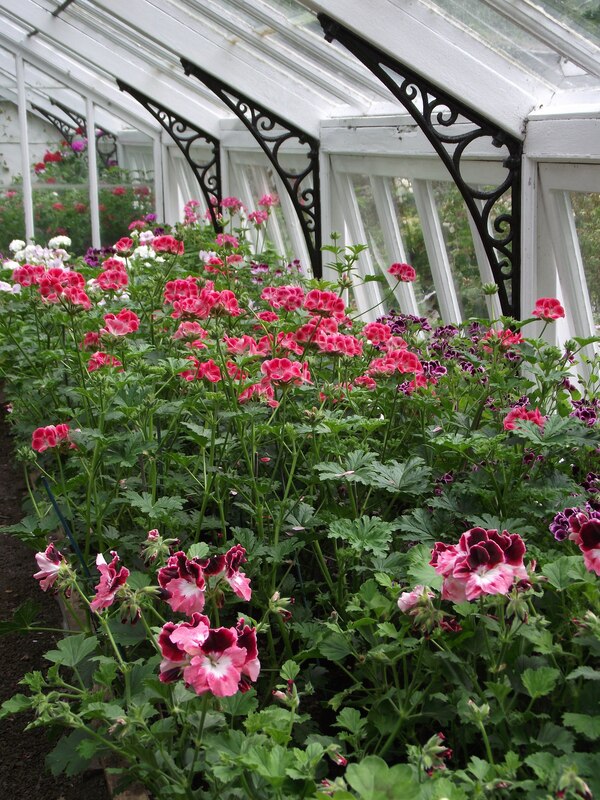 They bring fresh geraniums and house plants into the Abbey from the greenhouses every Monday to brighten up the house. We had two lovely weddings on the Saturday and Monday of the Jubilee weekend, both ceremonies were held in the Summerhouse in the Walled Gardens. They were so lucky and had beautiful weather and the gardens looked stunning. They had an enormous Teepee on the lawn for the evening receptions and the smell of the hog roasts was tantalising! 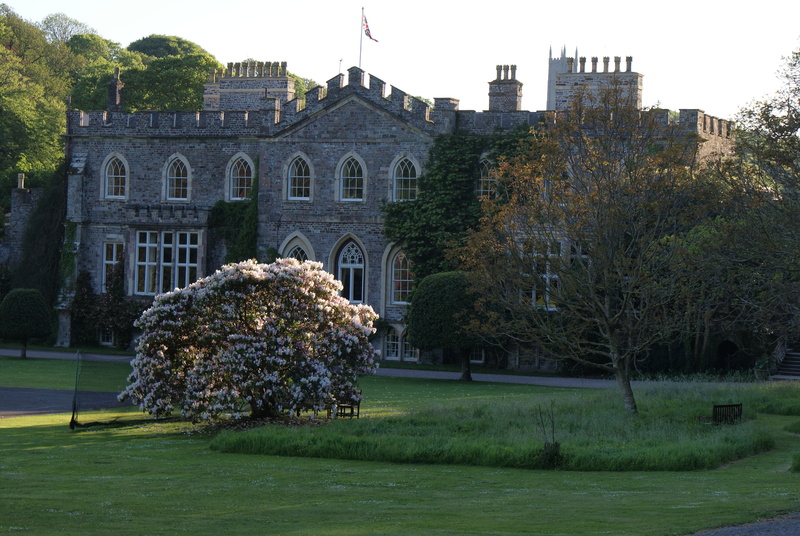 best in May and June, and visiting the many lovely gardens in the area including Docton Mill, Clovelly Court and Castle Hill. Jenny is a fantastic person who runs her own walking company, mainly coming to southwest England but also to the Alps; she brings parties every year to stay in the house. We have also thoroughly enjoyed having parties of Americans and Australians to visit the Abbey and gardens and to have lunch with us. Sir H takes wonderful conducted tours of the house with plenty of naughtly stories of earlier ancestors! 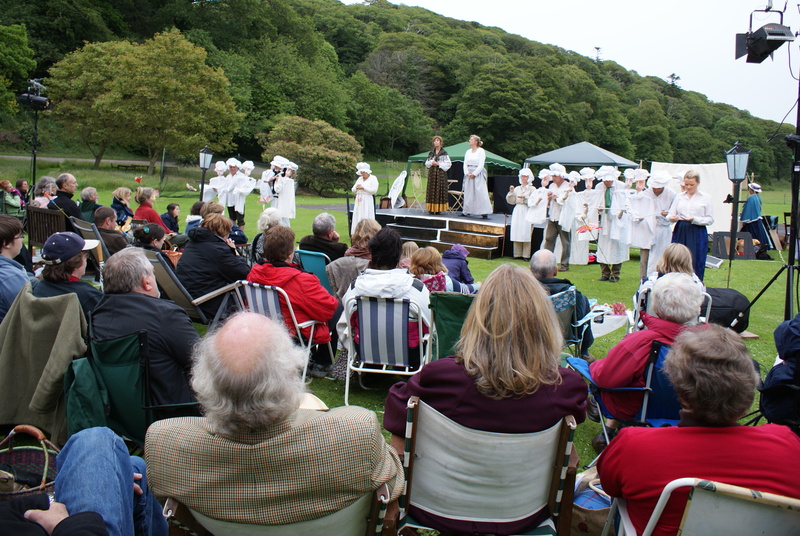 We held our first outdoor theatre performance in the garden on June 17th. 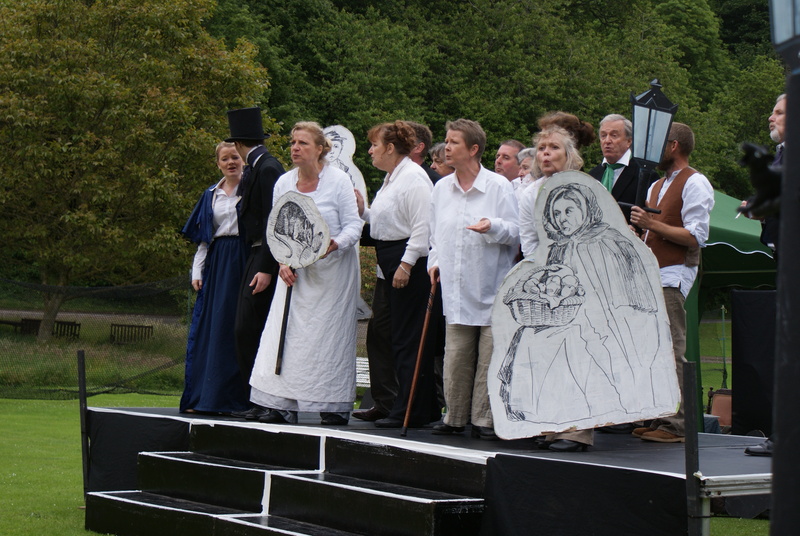 We were so lucky with the weather that evening and we had a good sized audience who really enjoyed the production of ‘Nicholas Nickleby’ performed by The Plough Arts Centre players. It was enormous fun and an excellent performance; the front lawn was a lovely setting for it. 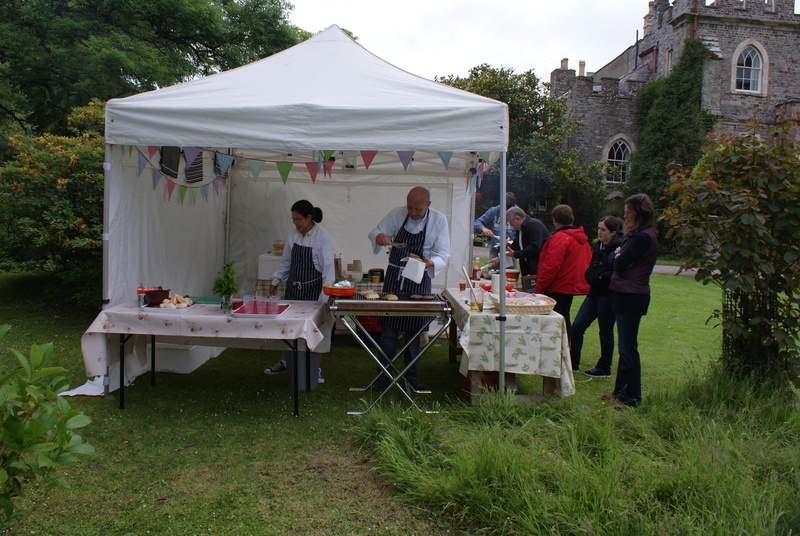 Sam and Em from Exmoor Kitchen put on a delicious barbecue and we had a Pimms and Wine Bar ably run by Paula from Hartland Quay. Putting up the new ‘Party Tent’ for the bar was quite a feat in itself but we were determined to succeed as our children had told us emphatically that ‘we’ would never manage to do it! 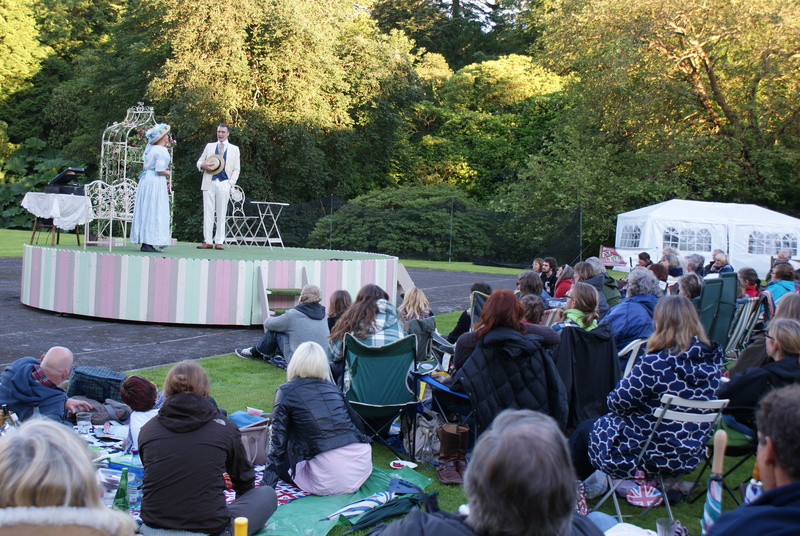 Next Saturday 7th July the Miracle Theatre is putting on ‘The Importance of Being Earnest’ on the lawn so we are crossing our fingers for a lovely evening but if it rains it will still be great fun and there won’t be any need for mosquito cream! There will be lots of time beforehand to have a drink and wander round the gardens. The barbecue will be delicious so there is no need to bring a picnic if you are feeling lazy! Now July is here and all the grandchildren and their great grandmother are about to descend on us for their summer holidays. They adore staying at the Abbey and I do apologise in advance to any visitors who might find random toys lying about and the general untidiness that comes with exhuberant children and dogs! But it is a great joy to us and lots of the extended family and friends come too to make it a really happy time. I am afraid that it will be picnics on the beach huddled in mackintoshes, but luckily children are oblivious to the weather and freezing parents and only interested in making sandcastles. I will be doing my best to produce plenty of nourishment but it certainly won’t be Cordon Bleu! Last Saturday (7/7/2012), with headlines of nothing but flooding in South Devon and Dorset, here in North Devon we had almost uninterrupted sun! 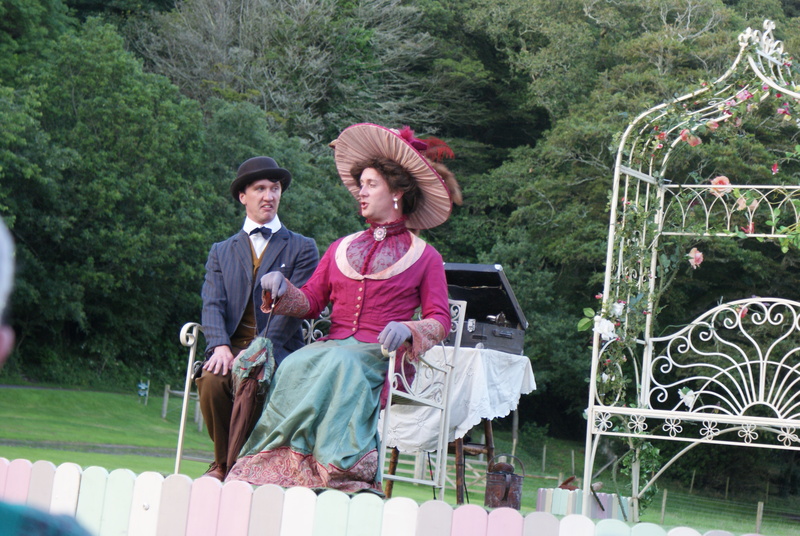 We were so nervous having heard the forecast but we were able to hold another fantastic evening of outdoor theatre. 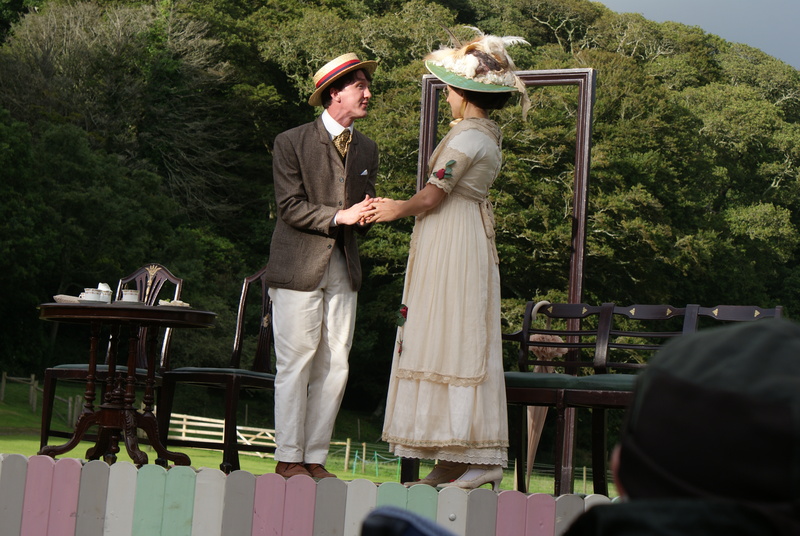 The Miracle Theatre Company, based in Redruth, put on a really fabulous performance of ‘The Importance of Being Earnest’ with a brilliant audience lapping up every word. Not a drop of rain fell! We were all able to relax, drink Pimms from the bar and eat our delicious barbecued food cooked by Em and Sam; it really was a quintessential English summer evening! My husband enjoyed it more than any other play he had seen. The acting was outstanding and if anyone has a chance to see them whilst they are touring the south west, do go, it is really worth it! We loved it. Lets hope they will come back next again year. Can’t wait! Many thanks to Richard Wolfenden-Brown of The Plough Arts Centre for bringing the Miracle Theatre Company here. Our next performances are ‘The Twits’ here on 1st August and ‘King Arthur and the Sword in the Stone’ on 14th August; the grandchildren are getting really excited. 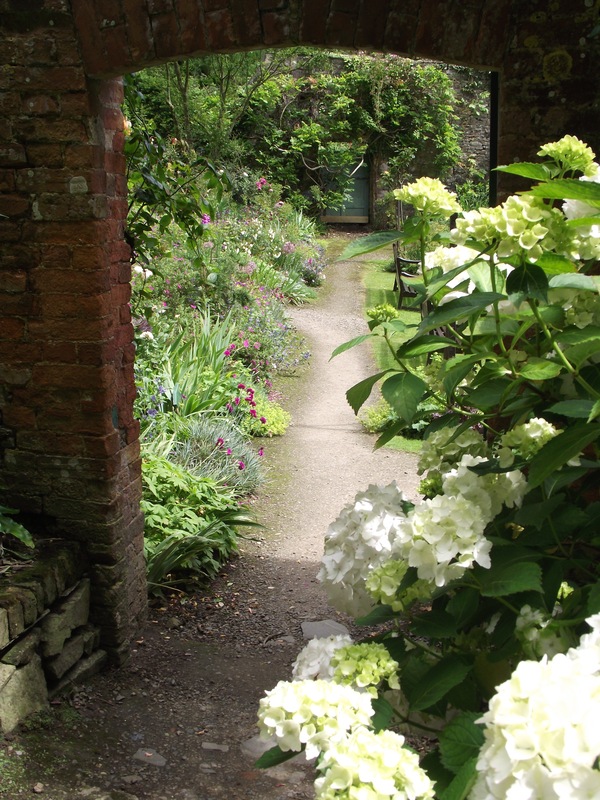 Then on 1st September ‘Private Lives’ by Noel Coward is coming, so it is all happening in the Abbey valley this summer. All the details are on our website.Thank you to everyone who has come here so far and lets hope for lots more fun. Believe it or not the gardens are looking wonderful. The hydrangeas have adored the rain and looking at their best. There are really deep blues, sparkling whites and some blackcurrant and raspberry colours. The shrubbery looks rather like a jungle with all the lush foliage and makes a great place to explore for children. 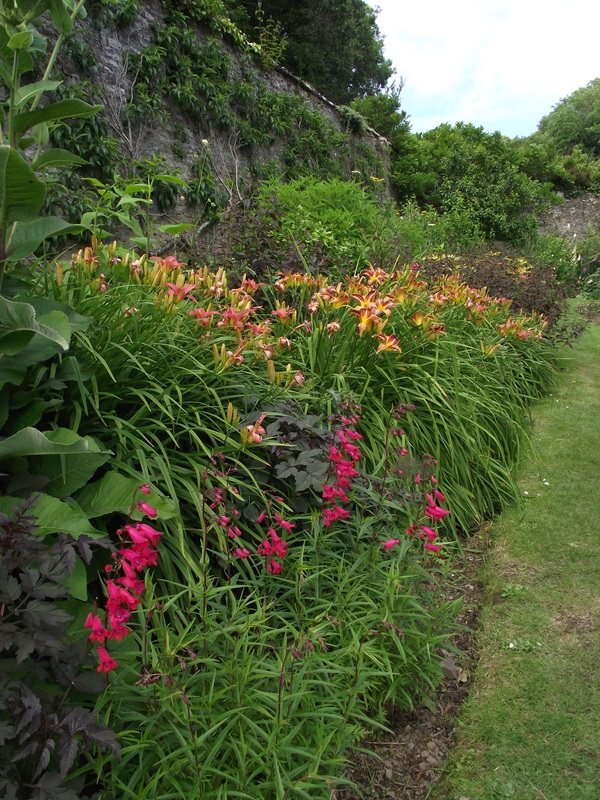 The Walled Gardens are looking really good with the hot border in the vegetable garden looking vibrant. The vegetables are still on a go-slow but we have more lettuces and artichokes than we can eat despite having them every day! Visitors have only to ask Nigel as he has plenty to sell! I refuse to buy vegetables and Nigel says that we won’t have to wait much longer now! The sun is promised soon, we are told. Summer is arriving, at last!